Allen Americans in CHL Finals - $9 ticket + hat! You can get a terrace level ticket to see the Allen Americans in the Ray Miron President’s Cup Finals + a FREE Americans hat for just $9! The Americans host the Rapid City Rush Tonight, Friday, and Saturday at the Allen Event Center. The Americans will be offering $2 beer, $2 hot dogs, and free thundersticks to the first 2000 fans in attendance! Offer available at the Box Office, Ticketmaster Charge-By-Phone, Ticketmaster outlets and ticketmaster.com by entering the password MOM into the PROMOTIONS AND SPECIAL OFFER box. Offer valid April 27 – May 6, 2010. Discount applies to tickets $55 and under, not for On Ice or previously purchased tickets. Tickets subject to availability. Cannot be combined with any other offer. No refunds or exchanges. Date, time & skaters subject to change. Because the Allen Americans have made it to the Finals, the Allen Americans are launching Fan Appreciation Week today. Specials include $2 beers and $2 hot dogs for the last three home games of the inaugural season! DREAD THE RED! Check them out: www.AllenAmericans.com They rock and are so worth the drive north. Did I mention tickets start at $10 and there's not a bad seat in the house? Yea! DREAD THE RED! Central Market is celebrating the 40th Anniversary of Earth Day tomorrow! If you bring in 5 plastic bags - they can be from anywhere - to recycle between 3 pm and 7 pm tomorrow 4/22, they will give you a pass for a free reusable CM bag in bright spring colors for all your shopping trips! Look for Earth Day CM Organics coupons and deals in store, too! Wednesday, April 28, 5-10p.m. at participating stores. 31 Cent Scoop Night at Baskin-Robbins helps honor America's firefighters. The Baskin-Robbins Community Foundation is donating $100,000 to the National Fallen Firefighters Foundation™. Participating stores will reduce prices of ice cream scoops to 31 cents*. At some locations, you may also have an opportunity to make a donation to your local fire charities. Sure Lady Antebellum's song about drunk dialing has been overplayed (you did know that's what that song's about, right? ), but we all love Tim McGraw. 'Nuff said. Bon Jovi wants you to step inside The Circle. For a limited time you can save over 25% on Bon Jovi tickets. GET BON JOVI TICKETS FOR $35! 1. Click on 'Find Tickets. 4. Follow remaining steps for purchasing. The Green Day with special guest AFI pre-sale password has been added: For a LIMITED you can buy your very own tickets to Green Day with special guest AFI BEFORE the public. The free presale password for Green Day with special guest AFIs concert in Dallas, TX gives access to tickets for a short time. This might be your best chance to see Green Day with special guest AFI perform! Here are all the event details you will need. Three Words: Manatee. Net. Cam. So, you keep drooling over the pastries at Starbucks, but your Sig-O only give you enough allowance for coffee? 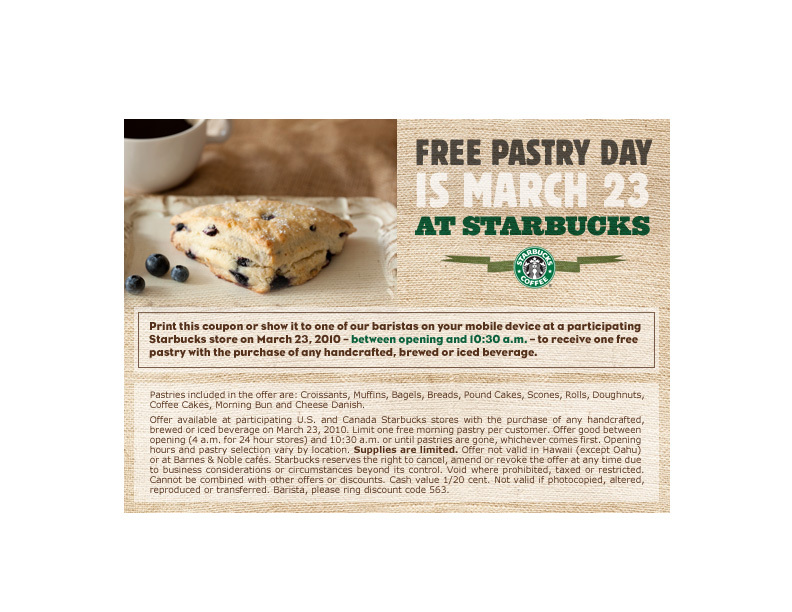 Have no fear because on Tuesday, March 23, Starbucks will give you a free pastry. Just click here for the coupon and the details. Yum. Tony Award-winning musical "SpringAwakening" opens next week in Dallas and tickets have justbeen reduced by up to 50%. Dress Circle tickets are now $35 (reg. $55-$75) with thebiggest savings found on weekend matinees. Friday and Saturday nights are excluded, along with the April 3 matinee. The show will run until April 4 at the AT&T Center Winspear Opera House. Spring Awakening is a rock musical that celebrates the journey from youth to adulthood, and features music from recording artist, Duncan Sheik. To buy tickets, click the link below and follow these instructions.- Click on the "Click Here for Tickets" above the video.- Enter code "TZOOSA" in the box marked "Promo Code. "- Select an show from the dropdown menu marked "Jump toDate" and click "Purchase. "- The discounted tickets are in the Dress Circle. Or call 214-880-0202 and use code "TZOOSA." Fees of $5 per ticket and $5 per order will be additional. BECOME A SUSHI CHEF IN THE RA - Monday, March 15, 6:30 p.m.
Join RA for a great date night or a fun group activity at its Sake & Sushi Social. Learn sushi rolling and sake pairing basics while indulging in sushi, appetizers and sakes for just $30 per person. You will finally be able to cross becoming a sushi chef off your bucket list! What's Better Than Oregon Trail? The Dallas Wine Trail! We are pleased to announce the next event of the Dallas Wine Trail to be held on March 27th 2010 at the 4 Dallas wineries. The event will start at 11AM and run until 5PM. Participant will start at CALAIS Winery or FUQUA Winery where they will pick their wine glass and their wine bottle. Each participant will sample 3 wines at each winery. Light food pairings will be available at each winery. All the wines poured will also be available for sale to drink onsite or offsite. DALLAS--MARCH 4, 2010-- For three games only, the DallasMavericks just slashed 50% off Lower Level and Club tickets. Wine walk on Cedar Springs tonight. Woo hoo! Five dollars is all it takes to get free-flowing wine from participating stores on your favorite gayborhood streets–pick up your glass from Buli Cafe’s tent. I hear you'll want to head to Nuvo. 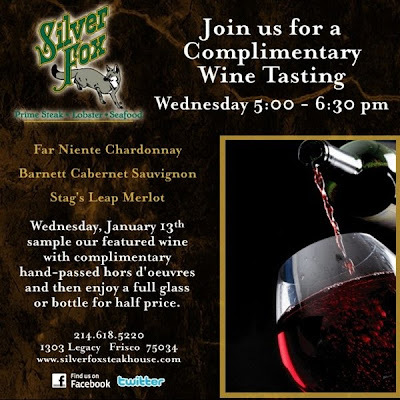 Not only will you fill up your glass here, you’ll take 20 percent off your purchase from 6 pm to 9 pm. Look for one-of-a-kind gifts and an amazing card selection. You can stop in Outlines Men’s Wear, Union Jack, and Skivvies (an undies store) for your favorite metro man (and more wine and discounts). Buy a product, get one 50 percent off at Zen Salon. And, heck, after all the wine, maybe, just maybe, you’ll stop in Condom Sense, too. Check out www.shopcedarsprings.com for more information. Moet & Chandon has been the official champagne of the Golden Globe awards for nearly two decades and in 2009 became the exclusive champagne of the Oscars®. As the exclusive champagne, Moët will be the only champagne served at the 82nd Annual Academy Awards. Join select Sigel’s locations this weekend as representatives of Moet & Chandon Champagne lead us through a tasting of the official Champagne of the 82nd Annual Academy Awards. Winery representatives will be on hand to taste through both the Moet & Chandon Imperial White Star and Moet & Chandon Imperial Nectar Rose. So sad to see that, after 10 years, Cuba Libre on Henderson has closed. Once the hottest spot on Henderson, the two-story restaurant with a Latin theme closed yesterday. The owners say they're be opening a new restaurant in it's place, but I have to say I'm bummed to see them close. I loved those pitchers of mojitos, even more when they were half-price during happy hour. We all get bored and play on the internet at work. (How else do you think this blog gets written?) But here's the newest, niftiest thing for you to do at work when you're bored - Make Money! You can also use the site to farm out your own little jobs and you can pay crazy low wages (think 20 cents for 5 minutes of someone's time). Need your blog posted to other sites? They can do it. Want to become a fan of something on FB and get paid for it? They've got that too. Here's what you do: the next time you have a ten-minute job that needs handling—posting that picture of you and Bono to Flickr—you'll log in and list the gig. You'll want to say how much you're willing to pay—most jobs will cost you the princely sum of about one dollar—and wait for someone (dubbed a "Microworker") to bid. Once the job is completed, you can grade the person's performance, or you'll be graded on yours. Each year, AMC hosts a Best Picture Showcase that allows moviegoers to buy one ticket, sit in one seat, get a free large popcorn (with refills, of course) and see all the Academy Award Best Picture nominees. Since there are 10 films this year, AMC is splitting the event into two Saturdays: Feb. 27 and March 6. Both schedules on both days start at 10:30 a.m., with doors opening at the theatre at 9 a.m. on the event days. A two-day pass is $60 online or $50 at the box office. A one-day pass for either Feb. 27 or March 6 is $30 both online and at the box office. (If you’re a member of the AMC MovieWatcher program, the two-day pass is $40 and the one-day pass is $25.) The event has been known to sell out, so buying your pass early might be a good idea. Also, if you only need to see one of the nominated films, theaters will be able to sell individual movie tickets for all shows starting at noon on the day of the event. To learn more about the AMC Best Picture Showcase and to buy tickets, visit amcentertainment.com/bps . Tickets are also available at the theaters’ box offices or at MovieTickets.com or Fandango.com. If you can’t make it to the event at all, you can follow the conversation on Facebook at facebook.com/amctheatres or on Twitter using the AMC-designated hashtag: #amcbps. On Friday, February 26th from 5-7 PM and Saturday, February 27th from 2-4 PM the following stores will be hosting a special complimentary tasting. Items to be tasted include: 10 Cane Rum, Newton "Red Label" Claret, Newton "Red Label" Chardonnay and Newton "Red Label" Cabernet Sauvignon. Cheesemongers at Whole Foods Markets across the United States, Canada and the United Kingdom at 3 p.m. Saturday will simultaneously demonstrate the traditional method of breaking into a 24-month-aged wheel of Parmigiano Reggiano, using official tools (knives) from Italy's Consorzio del Fromaggio Parmigiano Reggiano. These are 85-pound wheels, and the skilled carvers usually take about 30 minutes to complete the task, according to WFM's press release. If you're a cheesehead, this is fun to watch. Kids are entertained by it, too. So stop by any area WFM. SPREAD THE WORD FOR CHARITY! Hotels Combined For Charity began with the idea to raise money for charity whilst at the same time spreading the word about our free hotels comparison search engine. Mention Hotels Combined and our spread the word for charity program on your website and we will send $20 to a supported charity of your choice! There's been a bit of family drama concerning a fave mexican restaurant in town - Avilas's. Word has now come down that that shut the doors at the Maple location. They'll be missed, but word on the street is that it will be back in a new location. Keep your fingers crossed. Ready to Waste Away in Margaritaville? On February 23, 2010, You can join IHOP to celebrate National Pancake Day. From 7 a.m. to 10 p.m., they'll give you a free short stack of buttermilk pancakes. They do ask that you consider making a donation to support Children's Miracle Network, and since you're getting the pancakes for free, you should be able to afford that. Crush Wine Shop has announced that it will close its doors Feb. 22 after almost three years on Knox at Cole. "We have lost our lease," writes owner Jim Larkin in an e-mail, "and will be moving from this location. Future plans are uncertain at this time...but stayed tuned." In the meantime, the store will be conducting an inventory clearance sale to avoid having to move stock. "So come shop for some super deals," writes Larkin. No, you cannot have a penguin for Valentine's Day, but you can have a real, live, wearing a permanent tuxedo, holy crap he's cute penguin deliver your valentine. You'll be supporting the Fort Worth Zoo (which rocks) by adopting a penguin (no, you don't get to keep him at your house). But, OMG, it sounds like so much fun. There are various donation levels that come with a whole host of benefits, but for higher levels there is an add-on of a penguin delivered valentine. Hurry up and make your donation because those penguin deliveries are going FAST! is back. Free Grand Slam Tuesday is tomorrow (2/9). So figure out where your closest Denny's is and grab a date for and early Valentine's Day celebration. Oh, and it's only good until 2 p.m., so it's going to have to be a lunch date. Word on the street is that Tom Tom Noodle House in the West Village has closed. Bummer. They always had good bento boxes and I was always a fan of their patio. Tell Jon hi for me. They'll also have champagne specials on the 13th and 14th because, well, doesn't everyone feel sexier drinking champage? Save $10 on the BIGGEST All-Star weekend bash! You’re invited to the granddaddy of Dallas’ NBA All-Star parties, co-hosted by none other than Sean John Combs himself. Join Diddy and co-hosts Greg Buckner from the Memphis Grizzlies, Josh Howard from the Dallas Mavericks, and local radio stars Terrence J, Rosci, and Monie Love. Plus watch DJs from across the country battle it out. Save $10 on limited general admission tickets, just look for the box marked Special Ticket Offer at checkout. Forget Speed Zone. It's a short-lived thrill on the side of the highway and you've done it 100 times. Ready for the next step? How about North Texas Karting? It's like a go-kart, but you actually get to shift gears and go much, much faster than those silly child carts. Sure, you'll actually need to buy your own (they've got all the resources for you), but think of the thrill of real racing just inches from the ground. If you've got the Andretti gene, you'll want to check it out. Sounds like good time or a good V-day present for the loved one who loves speed. They may have too much time on their hands, but it certainly could make it a more interesting party. Next up, drinking game for the Republican gubernatorial debate in Texas. Shot every time Medina talks about guns or just generally does ridiculous banter. Shot every time Kay looks like stone or waffles on abortion. Shot every time Rick makes some stupid reference to him as being Texas and to Texas being so great that we should be subjected to another term of him. Good luck making it past the first 10 minutes without losing consciousness. Sig-O and I will be there for sure. You don't miss this special or this great show! They also have a cool wine site and kid site. Here's one more for the "Another One Bites the Dust" File. Sala, the Tex-Mex eatery founded by chef Doug Brown in his former Amuse space at 1326 S. Lamar closed on New Years Eve. Word on the street is that a neighborhood bar called Stop-Play-Rewind that was slated for Victory Park iss now moving to South Side where two-time Superbowl winner and Oak Cliff native Brian Williams will debut the concept under a new name. It’s time to party for a purpose. For a limited time, the Dallas Area Chapter of the American Red Cross is offering a “Couples’ Discount” for the Mardi Gras Masquerade on Saturday, February 6 at the House of Blues. Buy one ticket and you will receive another one free of charge. To learn more about the event or take advantage of this great offer, go to www.redcrossdallas.org/mardigras and click on Buy Tickets. As you complete your ticket purchase, enter “Mask” in the promo code box. Having been to this party several times, it's not to be missed. We'll see you there! That's right, free drinks thanks to Pure Dental. And go visit www.GayListDaily.com to sign up for their snarky fun emails filled with helpful tips for your tricks. With the next few days being balmy for January stop by the Dallas Arboretum at a discounted rate. Wednesday is buy one admission, get one free; Thursday is AT&T Senior Thursdays with $6.50 admission and 20% off in The Hoffman Family Gift Store. Sounds like a nice field trip during the work week. It's lunchtime again, which, let's face it, is like your favorite time of day. Now you can hit the new Beyond the Box restaurant and grab a yummy lunch on Wednesdays for just $7. It won't be like that tired old Subway sandwich you eat, but loathe. It'll be a yummy lasagna, salad and bread, or something else fabulous they put together. It's on Cedar Springs, underneath Ilume. Sounds like I know where I'll be on Wednesday. Speaking of that shopping center, Sig-O and I hit up Dish last night and it was yummy. GM Shawn Horne took good care of us. We'll be back. Soon. Check it out. For 99 hours, CheapCaribbean.com has slashed prices on all-inclusive Mexico vacations over peak winter dates from Dallas. Spend five nights beachfront at the BlueBay Grand Esmeraldaresort in Riviera Maya for $629 per person. This offer saves$100-$200 off the price of self packaging and is available to the first 99 bookings only. This offer is valid for travel through March 24 and April 12-30. You can visit http://www.cheapcaribbean.com/ or call 800-915-2322. The promo code "DFWCUN99" is valid for all Riviera Maya packages. So I recommend swinging by the Petal Pusher (3301 Gaston, Across the stree from Baylor Hospital). They've got a great deal on tulips - 10 stems for only $8. Did I mention their flowers really last? They're fantastic and will certainly get you out of the dog house or build up your brownie points. Yes dear, I'll swing by there after work. How about dinner and a limo ride to the Mavs game for only $39? Bengal Coast is offering the special deal to game-goers so they can avoid expensive parking, traffic delays, and cold walks from the parking lots. Park for free in the restaurant’s garage, enjoy a yummy dinner, hop in a limo, and cheer on the Mavs. Limited space. 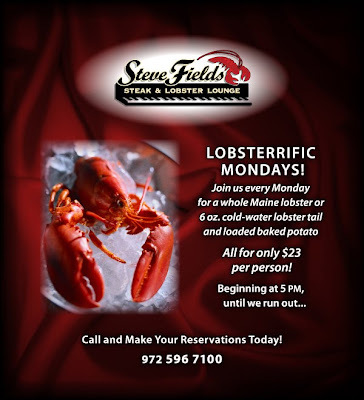 Reservations: 972-230-8144. You can snag cheap tix on ebay, craigslist or stubhub.com, but everyone will think you're someone important for showing up in a limo. Have fun. What better way to celebrate the end of the dreaded holiday season than with a margarita or glass of champagne? Head to Shade for cheap drinks and DJ Hooligan beats. $1 drinks from 10-11 pm. No cover. For discount bottles, call 214-289-9889. Dunkin’ Donuts will give away tasty treats if the Dallas Cowboys win this weekend. The Cowboys will try to win their first playoff game in 13 years when they take on the Philadelphia Eagles Saturday at 7 p.m. in Cowboys Stadium. Dunkin’ Donuts hopes to celebrate a victory with free donuts for fans at participating stores on Sunday. The offer is good for one donut in any flavor per customer during store hours, which may vary by location. No purchase is necessary. Looking for a surprise in town getaway (because staycation is a stupid made up craptastic word)? 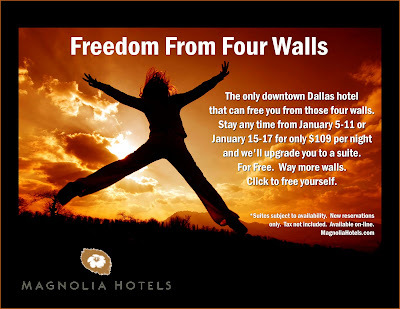 The Magnolia Hotel is giving you a free suite upgrade on selected nights that only cost $109. You don't have to tell the Sig-O that it's free, you can just let him or her think that how you roll. Roll on. Arena Football is Coming Back to Dallas! When the AFL disbanded in 2009 Dallas lost, quite possibly, its best sports team - your Dallas Desperados. If you never had a chance to make it to a game, have no fear because your chance has suddenly reappeared with the creation of Arena Football One. The season will start in April and they say tickets are already on sale, although I haven't seen the team website up yet. And, seriously, Arena Football is awesome. It's like football, but better because it's much faster and more exciting. :30 left in the game and your team is two touchdowns down? Don't worry, they can come back and win. At least the Desperados always did. Go Desperados! Are coming to town. Yes, that's right. Owl City, the reason for that cursed Fireflies song that makes us all go crazy in the bad way, is coming to town April 17. Sneaky? Yea, that sneaky song snuck into my brain and has turned it into mush. Thanks Owl City. Today, and today only, Which Wich is offering any sandwich for just 99 cents. It's customer appreciation day, so swing by and grab yours. There's a limit of one per customer. Yum. "Lombardi Family Concepts has announced today that it will sell its holdings in La Cubanita restaurant on McKinney Avenue in Dallas to its partners in the operation. "La Cubanita received such good reviews and excellent feedback from the guests," says creator Alberto Lombardi, "but it wasn't able to garner the numbers necessary to make it a success. Lombardis' partners will reopen the location with a new concept." La Cubanita will close immediately." How Long Can You Survive Chained to a Bunk Bed with a Velociraptor?